BORGER: She was clearly very well-received, as you saw, and today's event- not only just O'Donnell, but all of the speakers, were really embracing all of those Tea Party themes that we've heard so much about during this campaign season already- anti-big government, anti-health care, anti-any kind of bailout." Of course, Borger was using a liberal accusation against conservatives, that their opposition to ObamaCare translates to a more general opposition to all health care. She continued that O'Donnell used a "class warfare argument- the us versus them, which we hear a lot from Sarah Palin, and it's about the elites don't understand us." BORGER: Well, I think- just what you heard today, they got to figure out a way to capture the enthusiasm of the Tea Party voters, without, in a general election, look like they're captives of the Tea Party voters, and it's going to be a very difficult thing for someone to do because the Tea Party demands you to be ideologically pure, to a certain degree. And when you run in a general election as a Republican, you don't want to become Barry Goldwater, you know? You want to be able to win. The person I think back to is Ronald Reagan. Ronald Reagan- remember, he was able to capture Christian conservatives when he was probably the most secular president we've known in our lifetime, and that was because he was optimistic and open and welcoming, and I think that kind of a candidate in the Republican Party would be able to do both. Borger is a bit off-base in her analysis. She might be thinking about how Reagan wasn't a regular church goer during his time in the White House. But as National Review's March 22, 2004 book review of Paul Kengor's "God and Ronald Reagan: A Spiritual Life" outlined, the former president was far from being "secular." Reviewer S.T. Karnick noted how "prayer was central to Reagan's life. He prayed often, both in public and in private." Karnick also pointed out how Kengor explained "Reagan's 'religious truancy' - his puzzling lack of church attendance while serving as president - by arguing that he was sincerely reluctant to distract congregations with a celebrity's presence and large, intrusive security detail." Moreover, both the analyst and Malveaux overlooked the current president's "religious truancy" in office, to use Kengor's term. 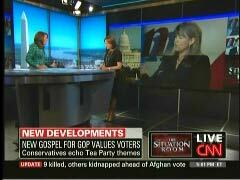 Earlier in 2010, CNN used similar labels to describe CPAC, another annual mainstream conservative meeting. Analyst John Avlon stated that the conference's "saving freedom" theme was "a little extreme" and "a little far out" during a February 19 segment. Three days later, anchor Rick Sanchez noted how Ann Coulter apparently "exemplifies the hardline spirit of CPAC." On other instances, the network has regular taken the time to label conservatives as somehow extreme. CNN legal analyst Lisa bloom condemned Proposition 8 in a January 12 editorial on CNN.com and labeled its supporters "lunatic-fringe bigots." Rick Sanchez hinted during a March 3 segment that Texas Governor Rick Perry was a racist. Less than a month ago, anchor John Roberts labeled Tea Party-backed Republican candidates "very far to the right" and specifically labeled Florida Republican Rick Scott as an "ultraconservative." All of this from a network that also claimed earlier this year that they were the only non-partisan network. -Matthew Balan is a news analyst at the Media Research Center. You can follow him on Twitter here.